The Atlas Copco LPP10 HD post puller is available in Ithaca NY, Rochester NY, and Upstate NY from the Duke Company. This is your best choice when removing hard-to reach crash barriers and road signs. With hardened jaws and an automatic chain-tightening clamp, this post puller is ideal for removing all kinds of wooden or steel posts including IPE, HPE, UPE profiles and round/square steel tubes. 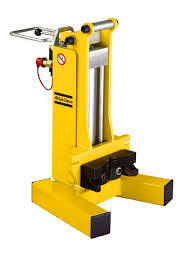 This post puller develops six tons of hydraulic pulling force. With the help of an optional, separate hand lever you boost the pulling force by an extra four tons. Weighing in at just 132 lb, it is the most compact and portable pulling device on the market. It’s perfect for on-site road repairs that cannot be accessed by heavy vehicles/excavators with a ten ton lifting capacity. The total available pulling force is ten tons. Remove any pole, steel beam or tube with diameter of up to 8 in. The main use is repairing barriers. Thanks to its low weight it’s great for hard-to-reach areas.